Åbo Akademi University invites all those who have completed their doctoral degrees to take part in the formal conferral ceremony if they have not already done so. At the ceremony, those who have completed their doctoral degrees are conferred with the title of Doctor and receive the insignia for their respective degrees. Honorary Doctors and Jubilee Doctors are also conferred at the ceremony. The conferral ceremony can trace its roots back to the earliest universities in Europe. Åbo Akademi University has retained a number of the conferment traditions from the Royal Academy of Turku (founded in 1640). The conferment ritual at Åbo Akademi University consists of the act of conferment itself, a ceremonial procession, conferral service and banquet. The conferrers speak Latin when greeting the promovendi and presenting the insignia. The sceptres, which symbolise the legal freedom of the seat of learning, are carried at the front of the procession. In earlier times, conferment also had legal significance. Today, the ceremony is primarily symbolic, with each Doctor choosing whether he or she wants to participate in it. The conferral ceremony tradition at Åbo Akademi University dates back to 1927. In the 1900s, conferment ceremonies were held for both Master’s and Doctor’s degrees by individual faculties or university as a whole. In the 2000s, the university has organised joint conferment ceremonies for doctoral degrees every other year or every third year. The doctoral hat symbolises academic freedom. Although the colour of the hat varies according to the university and faculty, all of the hat models used at Åbo Akademi University are black. The brim is flat, except for the Doctor of Science (Technology) hat, which is folded up on the sides. All hats are adorned with a lyre emblem except the Doctor of Theology hat, which has a ribbon. The doctoral sword originates from the faculties of medicine. At Åbo Akademi University, the doctoral sword is carried by Doctors of Philosophy, Doctors of Philosophy (Education) and Doctors of Health Sciences. The shield of the doctoral sword used by Åbo Akademi University is adorned with the Brahe wings. 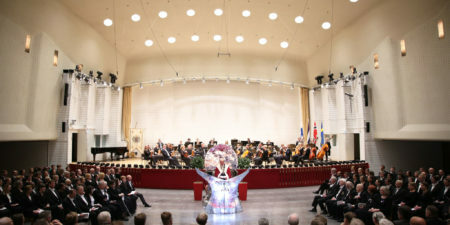 Honorary Doctorates are conferred upon persons by faculties in recognition of their scientific achievements or their contributions to the university or society. Insignia are the outward signs of the degree. All promovendi at Åbo Akademi University receive a doctoral hat and a diploma. The hat model and lyre emblem (or lack thereof) vary according to the academic field in question. Some degrees also come with other insignia: a doctoral sword or an embroidered collar/brooch. The title of Jubilee Doctor is conferred upon persons who earned their doctoral degrees 50 years ago. 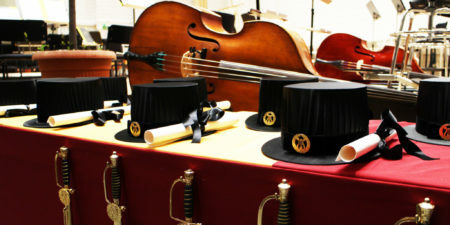 All doctoral hats at Åbo Akademi University bear a lyre emblem except the hat for the Doctor of Theology, which is only adorned with a ribbon. A majority of the faculties at Åbo Akademi University have chosen to use the University of Helsinki’s philosophy lyre emblem, which is comprised of the academic lyre surrounded by a laurel wreath. The lyre emblem used for Doctors of Technology is a benzene ring surrounded by a laurel wreath. The lyre emblem used for Doctors of Economics is comprised of the staff of Mercury, which has two snakes coiled around it and is surrounded by laurel leaves and lilies. The Latin verb promovere means to “move forward” or “promote”. The conferment is bestowed upon a person, the promovendus, by the conferrer. The conferrer also presents the insignia to the promovendus. Åbo Akademi University arranged a doctoral conferral ceremony on May 25, 2018. This year 91 persons were conferred.